Jenny divides her creative time between Portland, Oregon and the central Oregon coast in Yachats. 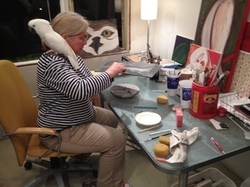 She has had the same studio assistant for 26 years now; his name is Austin and he is an Umbrella cockatoo. He is mostly happy and content to be wherever she is and can only hang with her as long as he uses his indoor voice. Jenny has forever known two things in her life to be true; She loves to think creatively and she loves to work with her hands. In 1997, She made the transition from working in glass to designing and producing ceramics full-time. All of her designs are hand built from a mid-range white clay body and then hand painted using underglazes. She enjoys the hand building process because clay is so flexible and forgiving and will do just about anything you want, especially if you are patient. Hand painting is more detailed and careful work for her. This stage is rewarding because it is whens he begins to see her ideas come to life. Jenny likes to depict animals and people in colorful and whimsical ways. She often incorporate words, sayings and proverbs when she can't resist. She could live forever fulfilled creating clay objects that are always food safe, mostly functional and consistently curious.